Get loaded with our Adults Load It Up Bundle. Stuffed with eight bits of Holdsworth kit its a bundle that any cyclist will welcome into their life. The Holdsworth Casual Clothing range is everything you've come to expect from Britain's most beloved cycling brand. Fine fabrics, time honoured colour combinations and an attention to detailing that shows through in every stitch. Our Ice Cream pattern T-shirt is a celebration of cycling and the British Summertime. Heavyweight plush cotton with contrasting arm and neck seams- do you want one flake, or two? The Holdsworth Ice Cream Travel Tote bag is the perfect carry-all for those quick trips out. Whether your popping into town, travelling or shopping you can carry all your essential items in safety and style. It might even look sweet replacing a Xmas Stocking under the tree. Head out in style with either the Holdsworth Team Beanie or one of our over-the-top Bobbly Dazzler Beanies. Plush knitted warmth for every head. Carnac's Gripper Gloves keep the chill off down into single digit territory, they're perfect on the bike, off the bike, on their own or worn under larger shells gloves and mitts for truly awful weather. They also look smart when walking the dog and their printed grippy palm makes them perfect work gloves. A Cotton Holdsworth Cycling Cap is included for those who don't favour knitted headwear. It's a stylish take on the classic cotton cycling cap and is available in a couple of different colourways. They're perfect for cycling and perfect as gifts for any serious cyclist. Climb every mountain in a great pair of cycling socks. An essential item of every cyclist's wardrobe and can make a huge difference to your riding comfort. With a longer cuff these Carnac KOM High Top Thicky Merino socks are perfect for riding in lower temperatures and everyday wear off the bike. We're finishing this off with the perfect pair of socks for the gym. Sorbtek's incredible Catch-Move-Release technology translates into the fastest drying, high-loft sock weve ever made. These simply superb socks will keep your feet warm in winter and help to keep your sweaty feet dry down the gym. 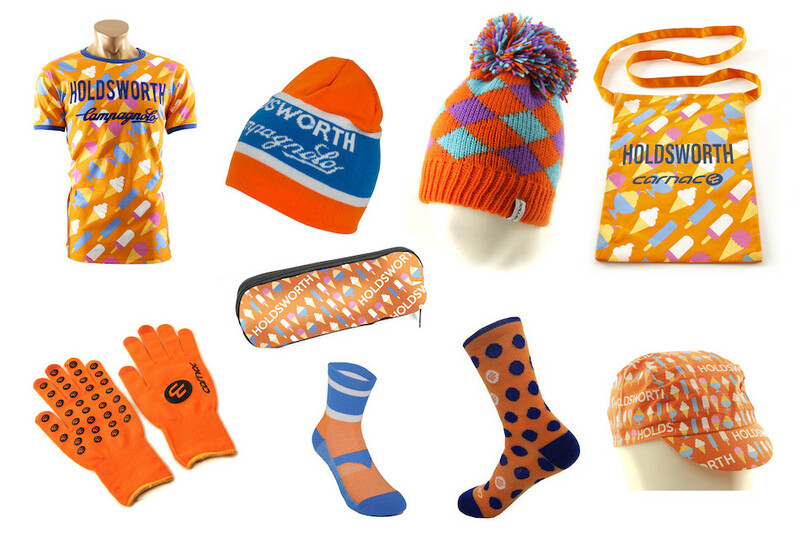 It's a cracking bundle stuffed with eight bits of Holdsworth cycling kit that'll make a great gift for any cyclist- or yourself if youre feeling like a treat.